Slovenia provides a critically important habitat for several large carnivore populations in southeastern Europe. 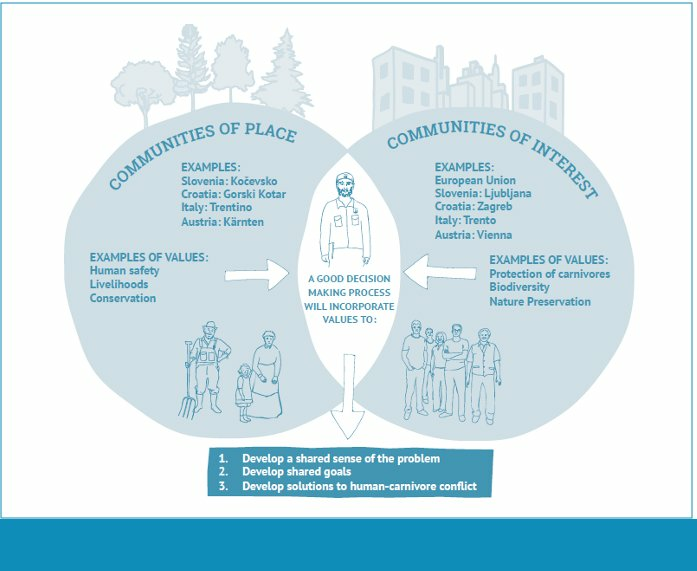 As a technical advisor to the LIFE DINALP BEAR Project, Seth Wilson developped a guidebook to strengthen the communication and conflict-solving skills of the Slovenian Forest Service. The guidebook can also be adapted to other regions. As an American conservation biologist based in Missoula, Montana, I had always dreamed about working internationally. As fortune would grant, during 2016-2017, my family and I had the chance to live and work in Slovenia. Sovereign since 1991 and a member of the European Union, Slovenia provides a critically important habitat for several large carnivore populations in southeastern Europe. In 2016, I was invited by the Slovenian Forest Service to act as a technical advisor to the LIFE DINALP BEAR Project - a five-year effort that seeks to manage and conserve brown bears (Ursus arctos) as one large population across Slovenia, Croatia, Austria, and Italy. A major aspect of the work entails reducing human-bear conflicts with local communities and improving prospects for bears to recolonize the southeastern Alps from the Dinaric Mountains of Slovenia and Croatia. One of the most important facets of large carnivore conservation is to develop a positive working relationship among wildlife managers, local communities, and other stakeholders whose collaborations are fundamental for addressing, reducing, and preventing human-carnivore conflict in a meaningful way. In Slovenia, my sense is that there is great opportunity for grass-roots, bottom up conservation, particularly in a post-communist environment where there is an appetite for more local control in decision making. This became clear when I started my major project - a book titled, “A Guidebook to Human-Carnivore Conflict: Strategies and Tips for Effective Communication and Collaboration with Communities”. The guidebook offers new tools and innovative approaches for field-level practitioners who want to conserve and manage brown bears and wolves that inhabit human-modified landscapes. Additionally, the guide offers practical tips for effective communication and proven strategies for building partnerships and collaborations with the people who live with large carnivores. The contents of the Handbook were developed together with the audience (in this case Slovenian Damage Inspectors). In interviews they were asked what skills they needed to improve. Many of the lessons developed for the guide can also be used by NGO personnel and others who are engaged more broadly in nature conservation. The content of the guidebook was presented at formal meetings with hundreds of Slovenia Forest Service personnel, to Croatian bear damage inspectors, and to carnivore managers in Italy. The guidebook prepares those on the front line of carnivore conservation in their critically important roles as wildlife ambassadors. It enables them to engage with communities using a participatory approach that bridges theory and practice in a clear and understandable manner. The engagement, excitement, and interest of the inspectors in the book was emblematic of a new change occurring in Slovenia - the growing appetite for a participatory democracy and an engaged citizenry.